Everything you need to start playing for "Fairs" or for "Keeps." 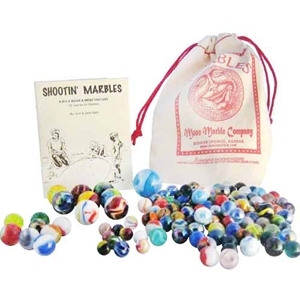 The set includes 100 Marbles 5/8", 8 Shooters 3/4", 8 Boulders 1", one Jumbo 1 3/8", 10 Pee Wees, 1 die, games & rule book, and cloth Moon Marble pouch. The Games and Rules Book contains terms, games, and marble history. The book is written by Jack and Sue Hahn. Very nicely done. Marble varieties may vary from photo. Warning! : Choking Hazard. This toy contains marbles. Not for children under 5 years.